A stylus is a slender, tapered utensil used for writing on wax-coated wooden tablets. 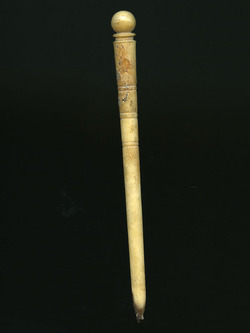 This particular stylus is made of bone and is missing its metal inset tip. The top of the stylus is spherical, used as a way to "erase" writing in the wax. This stylus is decorated with protruding ridges and horizontal parallel lines. There is some discoloration and damage to the bone at the top of the shaft. This stylus was constructed sometime in the 13th to 15th centuries. It is 84 mm in length and 7 mm in width. 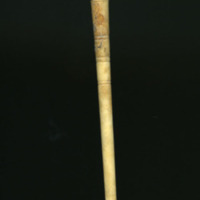 “Stylus,” Medieval London, accessed April 22, 2019, http://medievallondon.ace.fordham.edu/items/show/94.